Bringing a child into the world and focusing on his or her needs through infancy is a worthwhile goal. But as your child gets older and begins preschool or kindergarten, you may find that you are interested in returning to a career or getting an education to keep your options open in the future. By focusing on the best degrees for stay at home moms, you are able to enjoy the process of raising your children and accomplishing your career aspirations. The advantages of returning to college as a stay at home mom depend on your goals and situation. There are many benefits of returning to school for your education. The key is identifying the benefits that fit your lifestyle and goals. Jobs for educated stay at home moms are much more rewarding than unskilled busywork. A key advantage of returning to college is the options you have available for your future. While you may decide to wait on a career until your children start school, starting an online degree before that time gives you more opportunities and options when you are ready to consider a career. It allows you to consider the future for your life and the lives of your children. Obtaining a degree also gives you a chance to improve your life situation. A feminist stay at home mom may want to take measures to improve the situation at home by working in the extra hours she has when children start school or join a daycare. It allows you to focus on your life goals as well as your career aspirations. Whether you’re a single mom or in a relationship, the confidence that you can make your own way in life is a major boost for any woman. In some cases, the reason you decide to return to school and the advantage of the degree is greater freedom. It ensures that you and your family will not face financial challenges if a spouse has a health concern or a problem with their lifestyle. The flexibility and freedom gives you the confidence to focus on providing for the needs of your children. The obvious benefit of returning to college as a stay at home mom is the impact on your earning potential. A degree means you have more opportunities for advancement in a career and that enhances your earning potential. 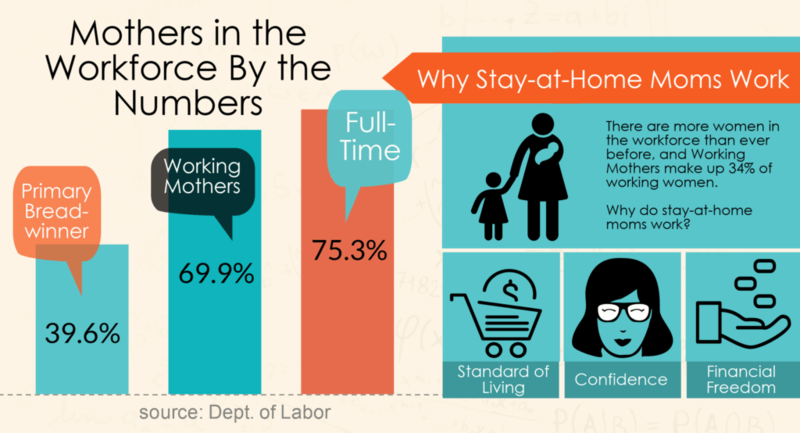 Jobs for educated stay at home moms can still be lucrative, professional careers. The amount you may earn after obtaining a degree depends on your level of education and your field of study. When evaluating the best careers for working moms, you may consider stay at home career opportunities. The same is true when looking at the best degrees for moms going back to school. Women worked for decades for the chance to work outside the home, but today the feminist stay at home mom can find jobs that let her provide from her own space. An online degree program makes sense for a stay at home mom because it allows you to provide the care and security your children need without turning to high-cost daycare programs. An online degree means you have the flexibility to work on your classwork when it fits your schedule. The best careers for working moms can work around a child’s nap-time, school hours or other activities to ensure that you keep up with your classes. You do not need to take your classes at the same time each day, so you are able to keep up with your studies. The degree also allows a stay at home mom to keep up with continuing education for career opportunities. It helps you stay up-to-date in a chosen field of study and allows you to work on your long-term goals for your future. 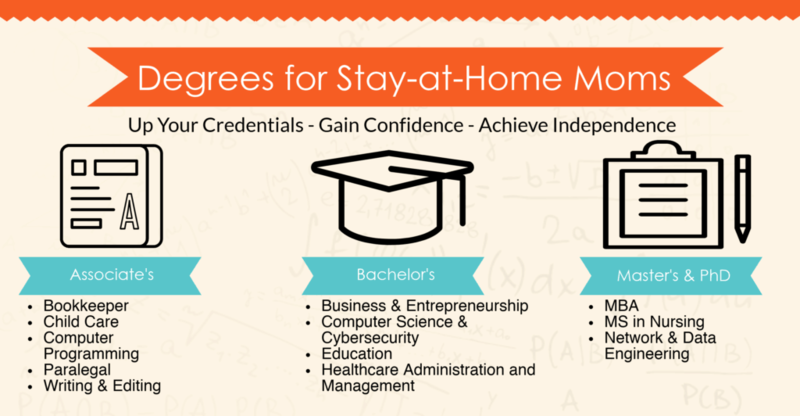 What are the Best Degrees for Stay at Home Moms? The number of mothers who stay at home has increased over the years, but the feminist stay at home mom makes the most of her time. While the reasons a mother may choose to stay home with her children vary significantly, many mothers are returning to school for an education. Identifying the best online degrees for stay at home moms will help you determine where to focus your education and prepare for jobs for educated stay at home moms. The best online degrees for stay at home moms help you find the right match to reach your career goals. Jobs for educated stay at home moms can range from working as a writer or editor to working in technology and computer programming. The options for an associate degree online help you find a career that helps with your goals. An online associate degree in early childhood education allows you to stay home with your children and care for other children in your local area. You will have the qualifications to set up a daycare in your home and provide a service that may appeal to other moms who are returning to work. You can also consider an associate degree in accounting, which opens new doors of opportunity to work from home. The degree allows you to reach out to small businesses and help with their bookkeeping goals. An associate degree in marketing may allow you to find new opportunities for a career that gives you flexible hours. That allows you to enhance your earning potential while still providing the care your children need during the day. When you want to find the best careers for working moms, you may want to consider a higher level of education. A bachelor degree online gives you more opportunities when compared to an associate degree. It also allows you to focus on more comprehensive fields of study for your interests and goals. An online bachelor degree in education allows you to start a career as a teacher at the elementary level. You can take on the role of teacher as your children start attending school and you will have opportunities to stay in touch with them throughout the day. It allows you to work the same hours when your children are not home once they start school, but gives you the flexibility to stay home with your children during holidays, afternoons, and weekends. If you want to focus on other areas of interest, then you may find a bachelor degree in business gives you more flexibility for your goals. A business degree allows you to work in a corporate environment or to set up your own company at home. When you decide to set up a business, you can set your own schedule and ensure that it fits the needs of your family. When you want to obtain a higher education as a lawyer or work in a similar field, an undergraduate degree in criminal justice or paralegal may open new doors of opportunity. The degree allows you to work with a lawyer and sets the foundation for a higher level of education when you are ready to consider new career paths. The best degrees for stay at home moms are not limited to undergraduate programs. You also have opportunities for a higher level of education without putting your children into a daycare program or leaving your home. You can work on an online master degree and still work with a flexible schedule. A master’s degree in entrepreneurship is a good follow up from an undergraduate degree in business. It helps you set up a company by learning valuable tools and skills you need to start a business. The education in entrepreneurship will allow you to work around the needs of your family while setting up a business for your future. A message to the feminist stay at home mom: getting paid is feminist. If you want to work in engineering, then an online master degree in engineering will allow you to develop the skills you need for the career. You can learn from home and take classes online to develop your skills as an engineer. Keep in mind that you need a strong foundation in math for a higher education in engineering. A master’s degree in business administration gives you the chance to climb the corporate ladder when you are ready to return to a career. Since the degree program focuses on the needs and interests of a business, you will want a strong foundation in business studies, financial studies, or accounting before you pursue a MBA. When you decide that you want to pursue a PhD program online, it is important to focus on your educational opportunities. A PhD will require an undergraduate degree and a master’s degree before you pursue a higher level of education. The standards to obtain your PhD will depend on the program you pursue, but you do have options for an online program (including a Doctor of Philosophy in Philosophy). A PhD in nursing through an online program allows you to start a career in the medical field when you are ready to pursue a career outside your home. You want to keep in mind that you may need to complete nursing degrees at the undergraduate level before you pursue a PhD in nursing, and you may need some nursing experience before starting the program. Self paced online degree programs for a PhD focuses research in theory and contributing new knowledge to your field. You can consider a degree in philosophy to allow for more self-reflection and research into philosophical areas of thought. If you are interested in criminal justice, then a doctoral degree in criminal justice allows you to work in the justice system. The online program allows you the flexibility to stay home with your children while still working on a higher level of education in your field. Are There Free Online Courses for Stay at Home Moms? When you have a strict budget, you may have concerns about the cost of an online degree program. Depending on your interests and area of study, you may have free courses available online to help with your goals. In many cases, free online courses focus on certifications rather than a degree. Certifications may help with your career aspirations, but you will need to take appropriate tests to obtain your certificate. Although an online program through an accredited college or university may have costs to consider, you can also cut back on the expense by obtaining financial aid or a scholarship. The first step to obtaining financial aid is filling out the paperwork for FAFSA. The federal financial aid may offer student loans and scholarships for stay at home moms based on current income level. You can also look into state-funded scholarships and aid. Your state may offer grants or scholarships to students who meet specific criteria for the grant. Keep in mind that you will need to fill out some paperwork or meet specific standards to qualify for aid at the state level. Colleges and universities may also offer scholarships and financial assistance. In some cases, you will need to do certain tasks or maintain a stated grade point average to qualify for the aid. Private scholarships and grants from businesses or other sources may also help with your college expenses. Keep in mind that you may need to write essays or meet grade point average standards to qualify for the scholarships. Some businesses may also require you to work in their company for a set time frame after you complete a degree when they offer a grant or a scholarship. Stay at home moms have an opportunity to accomplish their career and education goals without giving up on their time with their children. By taking an online degree course, you have the flexibility to work around your child’s schedule and provide the care he or she needs for long-term success. The key is balancing your time by focusing on a flexible online degree program that lets you work at your own pace.